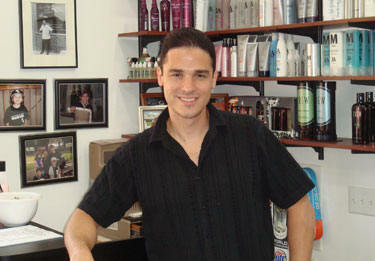 Founded by master barber Vince Ballone in 1960, Vince & Ginos is one of the most respected barbershops in Chicago today. Vince's barbering experience dates back to 1955 were he studied as an apprentice under a master barber in Castletemini Sicily. In Castletemini, Sicily he was trained in the art of straight razor shaving, mud pack facial treatments, clipper cuts, razor cuts, blow-dry and styling. Vince immigrated to the United States in 1959 and settled in Chicago, where he was able to purchase the building located at 2845 s. Wallace Ave. and started Vince's Barber shop in 1960: a modest two chair barber shop in the heart of the Bridgeport neighborhood where he continued to perfect his barbering technique and is still working today. Gino's experience spans from: colors, highlights, perms, body waves, chemical straightening systems, men women haircuts and styles. In 1992 Vince's son Gino Decided to join his father in the family business. Gino graduated tops in his class from beauty school in 1990, he was trained at one of the top salons in the Chicago area. He then took on the teachings of his father when he started working with him. Gino is currently the master barber at Vince & Gino's and plans to keep the family business around for as long as possible. Vince & Gino’s Barbershop & Spa was featured in a Google Commercial!